Rembrandt Watercolor Paint has various constituents including pure pigments and Gum arabic, which ensures the pigments adhere to the paper. All colors are highly permanent and Made in Holland 80 colors make up this marvelous range and include colors such as: Transparent Titanium White which is excellent for applying a very transparent veil-like layer, Super Transparent Azo Yellows and Reds, a full range of Transparent Iron Oxides for transparent earthy tones, and a range of granulating colors, such as cobalts, French Ultramarine and Earth Green for grainy effects. Pigments are triple-ground to a superfine consistency that produces maximum color clarity and allows the application of uniform washes even when highly diluted. Buy $50+ of Rembrandt Extra Fine Artists' Watercolors and receive 5ml Sepia (a $6.95 value) FREE*! 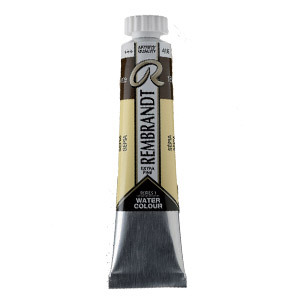 Rembrandt Extra Fine Artists' Watercolor Paints is rated 5.0 out of 5 by 2. Rated 5 out of 5 by Roxana from Love my Rembrandts I bought some new colors to expand my watercolor paints. I have loved working with Rembrandt watercolor for almost 18 years for the vibrant colors their pigments produce. Rated 5 out of 5 by Rusallachka from Great quality! I bought Rembrandt Gamboge 20 ml tibe about a month ago to try for mixing vibrant greens and was very pleased with the quality. The paint loads on the brush easily and created even washes with almost unnoticeable granulation. The amount of paint is outstanding for the price and it can replace W&N Quinacridone Gold in your pallette. It is composed of the same PY150 and PO48, but is a little less reddish.